Time For Little 'Bro To Get More Respect? : The Two-Way And speaking of the Super Bowl, did you catch the obscene gesture by singer M.I.A. during the halftime show? We missed it, but so did the person with a finger on the button that would have blurred the offending finger on TV. Eli Has Two Rings, Peyton Has One; Time For Little 'Bro To Get More Respect? 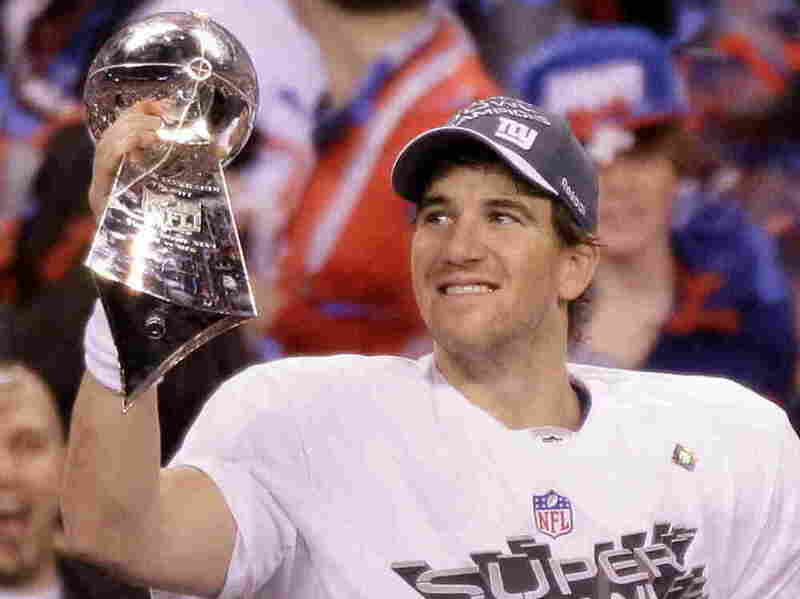 New York Giants quarterback Eli Manning holds the Vince Lombardi Trophy after the NFL Super Bowl XLVI game against the New England Patriots, Sunday (Feb. 5, 2012). After leading his New York Giants to a 21-17 victory over the New England Patriots last night, quarterback Eli Manning is now 2-0 in Super Bowl games. That puts him ahead of older brother Peyton, who has taken the Indianapolis Colts to two Super Bowls and won one. Injuries kept Peyton out of football this season and he may not be back. He's considered one of the best quarterbacks to ever play the game. But now, Eli has one more Super Bowl ring than his brother and has been the MVP in both games he's played in. So it seems fair to ask whether it's time to talk about both Mannings as being among the best ever. Their career "quarterback ratings" aren't too close — 82.1 for Eli over eight seasons and 94.9 over 13 seasons for Peyton. But what do you think? Is Eli Manning going to wind up being as highly regarded a quarterback as his brother Peyton? Meanwhile, the morning's other story line from the Super Bowl seems to be the fleeting finger of singer M.I.A. during the halftime show. We missed it, but she apparently flashed a middle digit as she performed during one of Madonna's songs. M.I.A. also may have added the F-word just to get her point across ("though it was hard to hear her clearly," The Associated Press says). The NFL and NBC, which broadcast the game, are apologizing. A spokesman for the TV network says a system that should have digitally blurred the offending finger wasn't activated in time.